With still some weeks left of Summer, the Season is far from over! We are having a fantastic summer, lots of events and viewings over the month has kept us very busy! Despite the weather we sponsored the MDL Torquay Marina Rally, a cruise to Brixham’s RNLI Seaside Special which was a very successful event. Complimentary Pomeroy champagne on arrival, following by a BBQ and topped off with fireworks after dark. 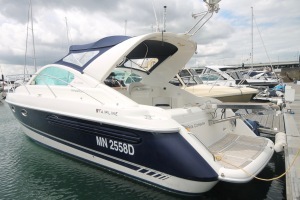 One Marine are pleased to offer for sale yet another great example of a popular Fairline model. The Fairline Targa 34 offers a perfect balance between stunning design, performance and family practicality. 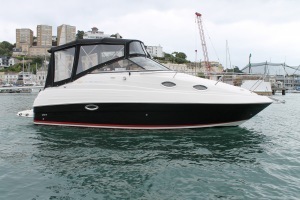 Priced at just £89,995 is the perfect boat that will take you through the rest of this season and beyond. We also have a 2005 Regal 2465 Commodore for sale priced at just £34,999, benefitting from an engine service and anti-fouling this month, this is a very well-maintained example of a Regal 2465. With spacious accommodation for four this is ideal for families, there is plenty of room and comfortable with everything you need onboard to get away for the weekend! There is plenty happening over the next couple of weeks, we have Dartmouth Regatta where we will be showing casing a new Sunseeker Manhattan 52, new Invictus 250CX and numerous supercars from our partners HR Owen – more details to follow later. With completions, new listings looming and the Southampton and Cannes Boat Shows, we are bound to have a busy September. We are open seven days a week, so we can arrange viewings at a convenient time to suit you. Please contact our office on 01803 29 22 39, alternatively email us on info@onemarine.co.uk and one of our dedicated team will be happy to help.